Small-Life Supplies manufacture insect cages for schools, laboratories and the general public. After graduating in biology from Cambridge University, Dorothy Floyd set up this mail-order business in 1985, selling Indian stick insects which she had reared, and aluminium insect cages which she designed and made in Cheshire. As the business expanded, it relocated to an industrial unit in Leicestershire, and has now moved again, this time to Cambridgeshire. Small-Life Supplies still follows its core principles. So a lot of care and expertise goes into the design of the cages. 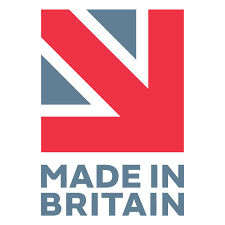 These cages are then manufactured in the UK and dispatched to customers nationwide and worldwide. All our stick insects are captive bred in our cages in the UK. The stick insects are used to being handled. We only breed the harmless species and guarantee live arrival. These are delivered nationwide. 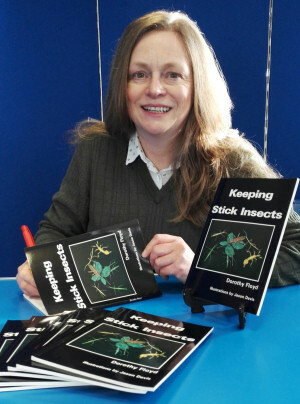 Insect husbandry advice is freely given, via our Ask Professor Phasmid page, and more information is in Dorothy Floyd's best-selling book "Keeping Stick Insects"
Dorothy Floyd signing her book "Keeping Stick Insects"
Whether you prefer thin stick insects, or chunky ones, we can send these to you. Our stick insects are safe and used to being handled. We can also deliver the fresh bramble leaves for them to eat and potted eucalyptus plants too. NEW! 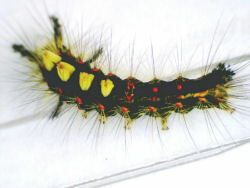 Watch these caterpillars grow, they have a fast lifecycle! They eat fresh bramble leaves. Release the adults outside. We're always happy to help, so please contact us. We guarantee live arrival and let you know in advance when delivery will be. Small-Life Supplies, Bassenhally Road, Whittlesey, Peterborough, Cambs. PE7 1RR. Small-Life Supplies on 01733 203358 weekdays during office hours. We are GDPR compliant. be copied or reproduced elsewhere. Small-Life Supplies, Bassenhally Road, Whittlesey, Peterborough. PE7 1RR.